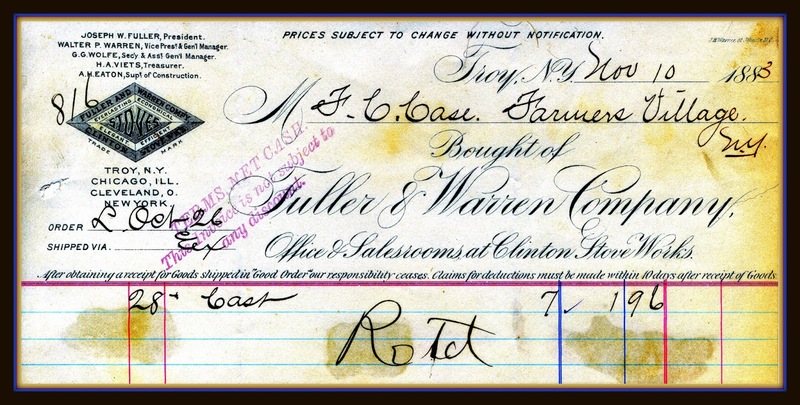 Customers came from all over to purchase Fuller & Warren products, even some from places that no longer exist. 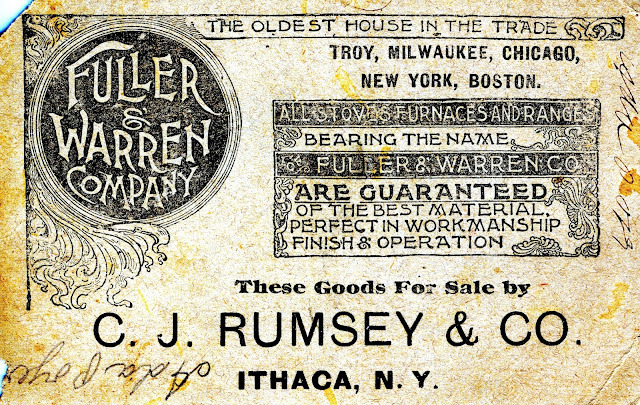 Charles J. Rumsey operated a hardware store in Ithaca that sold not only stoves and furnaces, but other merchandise as well. In his book, Ithaca and its Past: The History and Architecture of the Downtown, DeWitt Historical Society of Tompkins County, 1982, Daniel R. Snodderly states that the business spanned the years 1876, when C. J. Rumsey became a partner to 1962, when it was replaced by the Outdoor Store on the Ithaca Commons. A century later, it's not clear which device had tooth-saving qualities. 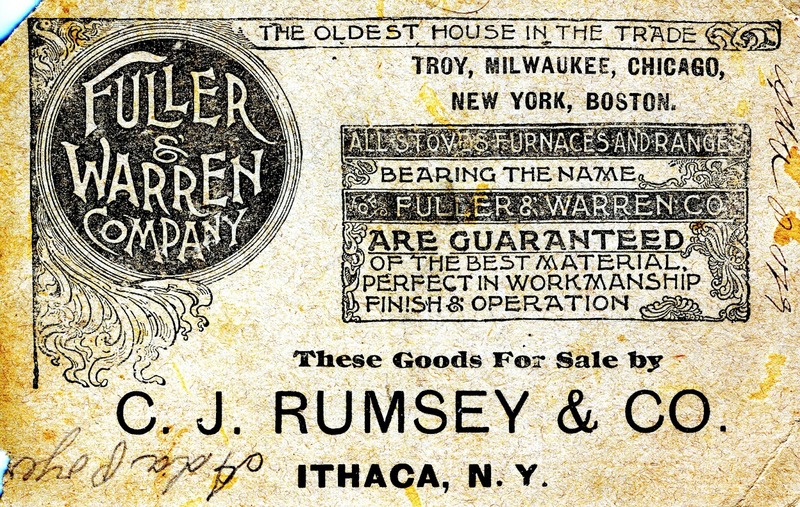 Tragedy struck the Rumsey family in 1906, when John Cooper Rumsey, Ithaca City fireman (Torrent Hose Co. no.5) and son of Charles J. Rumsey was killed while fighting a fire at Chi Psi lodge, a Cornell University fraternity. He and several colleagues were killed when the north wall of the burning building collapsed on them. Not long after Ada Poyer (1886-1980) learned how to write, she was given this valuable souvenir of her family's visit to C.J. Rumsey's store. In her best cursive, she affixed her signature to the back of the card. 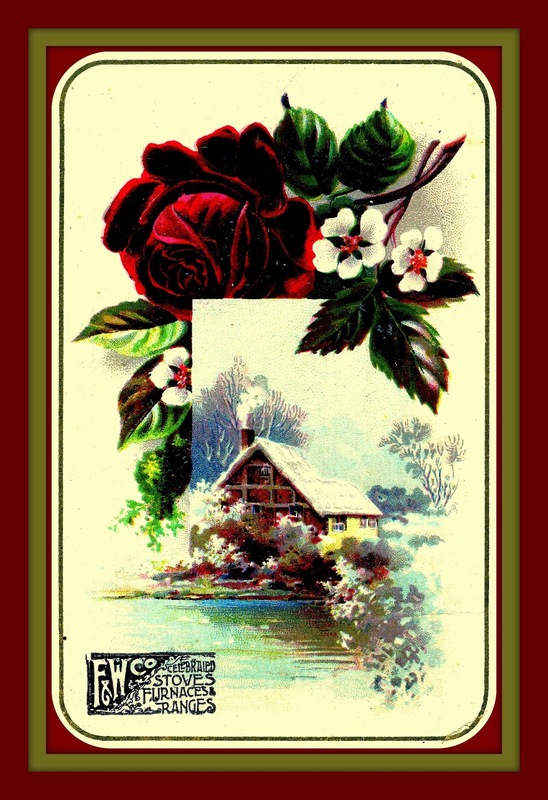 The card was kept as a valuable keepsake, perhaps long after she wed Edward Albert Thomas, maybe until she passed away a month after her husband in 1980. The card may have passed through many hands after that, always being saved as an item of curiosity, if not of any particular value. In the summer of 2017 it left its temporary home in Lexington, Ohio and arrived back in the Village of Lansing, NY just outside of Ithaca, where it was added to the Earl J. Arnold Advertising Card Collection. From the 1890s, Ada Poyer says "Hello" to her descendants and reminds those of us living today that all of our activities, no matter how mundane they appear, are significant and worthy of note.